This article first was published by WDDE.org, Delaware’s NPR News Station on August 2, 2012. Bee colonies across the country began mysteriously collapsing in 2006, and have had scientists urgently seeking a cause of the meltdown ever since. Now, researchers at the University of Delaware believe they’ve uncovered clues to solving this problem that threatens the delicate natural balance on which the nation’s food supply depends. At UD’s Newark apiary, where 22 hives are home to more than 1.3 million bees, researchers are focusing on an invasive parasite that can be as devastating to a bee colony as its Latin name, Varroa destructor, implies. The mites are one of several culprits that may be combining to cause Colony Collapse Disorder, which has resulted in the die-off of tens of billions of bees nationwide. Debbie Delaney, a UD assistant professor of entomology and wildlife ecology, says combating one possible source of the decline might be as simple as mimicking a bee’s natural behavior, at least for small-scale beekeepers like the 300 apiarists in Delaware who host the majority of the state’s honeybees in their backyards. While State Apiarist Robert Mitchell describes the status of the honeybee population in Delaware as “adequate,” he adds that colony losses have taken a toll at a time when the demand for pollination services continues to grow. Various stages of varroa mites. Photo by Zachary Huang, http://cyberbee.net/gallery. The varroa mite is one of the “primary forces behind the decline of the honey bees,” said Katy Evans, a UD graduate student spearheading Delaney’s study. These little external parasites attack both adult honeybees and their brood, or young, by latching onto them and feasting on their blood. That may sound familiar to people used to swatting at mosquitoes, but varroa mites are no minor nuisance. Although we can just barely see them with the naked eye, Delaney explains that it is a whole different story from a bee’s perspective. “It’s as if we had a dinner plate attached to us sucking our blood,” she said. To get to that blood, mites have to penetrate the bee’s exoskeleton, leaving behind a wound that is open to infection from additional pests and pathogens. When feeding on drones, or male bees, the mites deplete the drones’ protein and sperm levels and eventually render the bee incapable of flying. In addition to feeding on drones, the mites attach themselves to the brood of young bees in the early stages of their development. “To make it even more awful, they vector viruses,” Delaney added. Just like a mosquito carrying malaria, or a tick bearing lime disease, these mites can transport and deliver new diseases directly into their hosts’ bloodstreams. 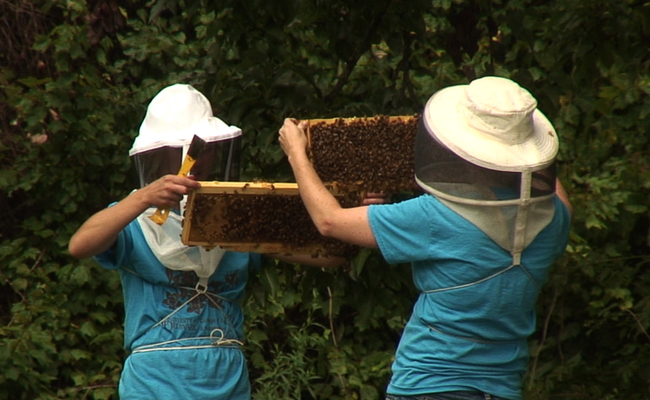 Delaney’s research at the UD apiary stems from observations she made in her backyard hives. So far, her bees have been healthy: no signs of virus, good honey production, and a strong population. She says that some of her bees have varroa mites, but they haven’t damaged the colony overall. She believes that the few mites on her bees at home have not had a chance to multiply because she employs a technique called hive splitting, which is modeled after bees’ natural tendency to swarm and establish two separate hives if their population outgrows the hive. Bee larva with 5 varroa mites on one side. Delaney is currently testing a theory that some natural beekeepers have claimed for years. During a hive-splitting period, bees don’t reproduce, and varroa mites have no baby bees to feed on. So the mite population dies off and takes so long to rebound that they never achieve numbers large enough to harm the colony. Bill Leitzinger, amateur apiarist from Middletown and president of the Delaware Beekeepers Association has used the hive-splitting technique to control varroa mites in his hives for ten years. Leitzinger says when he was growing up, his father used chemicals to address mites and other problems around his few hives. He decided to do things differently. “I have never used chemicals,” he said. “It used to be I was the weird one. Now most beekeepers are trying not to use chemicals.” He noted that the natural beekeeping movement evolved in response to research showing that chemicals applied to the hive can seep into the wax and remain in the hive for several years. Delaney points out that miticides are not the only chemicals that remain in the wax. Pesticides and fungicides applied to plants miles away can stick to honeybees’ bodies during nectar collection and hitch a ride back into the hive where they, too, remain in the wax for years to come. Recent research indicates that insecticides and parasites in non-lethal amounts can have a combined effect that becomes lethal. Delaney speculates that the combination of miticides and insecticides could have a similar effect. She hopes that her research will confirm that hive splitting is a viable alternative to chemical miticide application. “If we can reduce in any possible way any type of pest that gets into the hive matrices or that the bees come in contact with, then I think that’s a very good thing,” Delaney said.